I feel pretty bad giving this two stars. Many of these photos are truly amazing. The weird layout on most pages (2/3 of the photo on one side and 1/3 on the other) along with the inability to confine captions either to the direct subject or the poets the jacket promised really impaired my ability to appreciate those amazing photos. So two stars it is. I have given myself permission to read all of the fabulous photo collections my local library carries. (Isn't that a funny thing to have to do?) Surely I will find something else in this vein that is truly fabulous. With National Geographic you expect to find an excellence that almost cannot be excelled for they not only educate the mind but bring you into the world's most foreign fields or somewhere comfortably near so it makes me sad I can't rank this higher for myself. This book is somewhere up in the air for me. First of all there were some pictures that were actually rather breathtaking, they fit the idea of the book quite well and they are what you would expect to see within the magazine. Those were the pictures that stirred interest in you, that made you feel a part of something special and were just the right amount of spooky, soft, foreign, breathtaking or whatever other mood you may end up in. Sadly the majority of the pictures didn't fit the above guidelines for me. They were something plain like someone texting (ok I know that it was suppose to be night but that isn't really emphasized in the picture) on their cell phone, a blurry traffic scene in front of an ad or something else ho-hum. And there were a few pictures that were under the wrong part of the book. I enjoyed the idea of taking pictures and splitting them into the timeframe that makes up our day - Dawn, Sunrise, Morning, Midday, Afternoon, Sunset, Twilight and Night - to display the type of pictures that could be made. Any good photographer knows the right lighting, the right timing and the right background coloring is what can make a plain picture into a magical picture. Finally what also contributed to my low ranking of this collection is the fact of the writing. I love to know where the picture took place, how the photographer was able to reach it, to have some explanation of what was going on in the picture itself and the stories presented but they took away from the focal point of the book, which was photography. Being such a big book I was more focused on reading it then actually studying the pictures so I didn't take as long as I should to immerse myself in the snapshot itself. The best thing for this book was to have had the name of the photographer and the place where it was taken plus the occasional quote to be read. And then everything else could have been put in the back in an index for those who did want to read it - clean, organized and easy to access. Great photos. But the printing is not excellent. "With rich purples and deep blues, the pictures capture the end of the day when it’s time to wind down and think about our day and what’s to come tomorrow. There’s a great shot taken by William Albert Allard from Tiger Stadium that was hard not to love and notice right away. 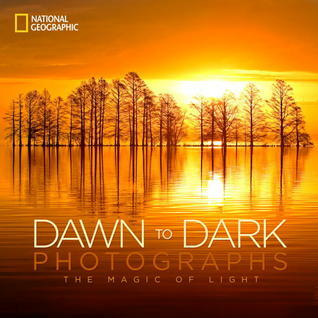 A great book if you love photography. "Read more here. Many of the images are stunning, some really not as good as they could be to be in a book like this. As a photographer I enjoy understanding the technical side as well like what settings they were shooting, duration, etc. Did enjoy the stories many of the photojournalist wrote, they certainly get to go to amazing places. I've been reading quite a few National Geographic books lately and this one is the first to really inspire me. Beautiful imagery from all over the world gives me the itch to travel and create iconic images. A few of these photos weren't actually all that impressive, but most were beautiful, and some were truly incredible. An absolutely gorgeous book. I want to find prints of several of these shots and have them framed. I liked more pictures in this book than Rarely Seen. It splits into 8 sections: dawn, sunrise, morning, midday, afternoon, sunset, twilight, and night. Sunrise was my favorite section of all, followed by sunset. Mostly scenery, with a few people and animal shots. Stunning photos, a great and difficult selection! Beautiful photographs from around the world celebrating light.